Aren’t you sick and tired of hearing politicians, here in Iowa and across the country, point the finger at you and me every time some criminal with a gun commits a crime? It’s a familiar mantra now in America. Before the blood dries, they rush to the nearest camera crew and demonize the millions and millions of law abiding Americans who carry a firearm every day to defend themselves and their families from exactly the kind of monster that attacked the night club in Florida last weekend. It’s our fault for owning guns. It’s Colt’s fault for making so many AR-15’s. It’s the video game developers’ fault. What you’ll never hear anti-gunners zealots like President Obama, the editorial board of the Des Moines Register, or local gun-grabbers like Rep. Bruce Hunter and Rep. Art Staed say is that they shoulder a major portion of the blame for these horrific crimes! The shooting at the military recruiting center in Chattanooga, TN, a year ago next month, that claimed the lives of 5 US service members – took place in a gun free zone. Instead, the Des Moines Register has this tone-deaf headline in their paper yesterday. We have to take these calls to action seriously. Already Iowa legislators, like Art Staed, are openly talking about trying to regulate (aka ban) modern rifles. This same bill was introduced in 2015, by a group of legislators. In our office, we’re already being attacked by gun-control activists around the state, demanding that we “stop making this political,” trying to guilt us into standing down in our defense of the 2nd Amendment. One activist from Iowa City called us “heartless and cold” for already talking about the political ramifications of what happened in Orlando last weekend. Here’s a message to anti-gun legislators, activists, and media outlets in Iowa: The members of Iowa Gun Owners will fight tooth and nail, as aggressively as we possibly can, using every tool at our disposal, to crush any attempt to clamp down on our gun rights here in Iowa! We will never grow tired of this fight. We will never agree to a “common sense compromise” that leaves us and our families vulnerable to a violent killer who refuses to obey your new gun control laws. You can try to use the horrific actions that played out in Florida in an attempt to guilt us into cowering silence, but that will never work. It’s shootings just like this one that galvanize us to fight harder – knowing that if you disarm us, or create more areas where we can’t carry, or limit the number of bullets we can carry, that our families will be that much less safe. Rather, we are waiting for you to acknowledge that your failed call for gun control has only resulted in more carnage. We are waiting for you to apologize for your part in endangering the lives of law abiding citizens. We are waiting for you to stand up for the 2nd Amendment as aggressively as you advocate for the 1st Amendment. But we know that you won’t. And that’s exactly why gun owners in Iowa can count on Iowa Gun Owners to always be there for them. The other side won’t rest, and we won’t either. Any politician who comes for our gun rights here in Iowa will face an immediate and highly organized push back from the day the bill is filed until the next election. And we won’t apologize for any of it. These are our rights. Our forefathers died to give them to us and we’ll fight to preserve them so that we can, in turn, pass them on to our children and grand-children. If you’d like to make a donation to Iowa Gun Owners to enable us to continue mobilizing Iowans in defense of the 2nd Amendment and to prepare to expose anti-gunners in the 2016 elections, please do so right away! P.S. In Orlando, the complete failure of gun control was on display yet again as the murderer in this shooting had passed a background check, passed another check to obtain a permit, passed another to get a job as a security guard, had been interviewed multiple times by the FBI, and still went on to rack up one of the largest body counts in American history. 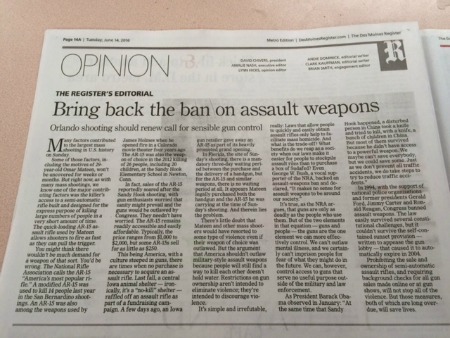 The response from anti-gunners in the Iowa legislature and their pals at the Des Moines Register: calling for yet more failed gun control policies and bans on firearms. They are counting on gun owners to somehow feel guilty for what took place in Orlando, when, next to the murderer, it’s anti-gun legislators who share in the blame for the creation of yet another gun free zone. Iowa Gun Owners will oppose any attempt, from any legislator, to clamp down on the 2nd Amendment here in Iowa using the most aggressive mobilization program possible. We make no apology for being proud gun owners and we’ll stand up for these freedoms just like our forefathers did. If you would like to join our organization, or would like to chip in an additional amount to help us mobilize Iowans, please do so here!